The Faculty of Arts and Social Sciences at Sabancı University is pleased to announce our new Psychology undergraduate program. The program will start admitting the first students during the 2014-2015 academic year. Students majoring in Psychology at Sabancı University will not only gain the basic knowledge and skills in the discipline of Psychology but will also equip themselves with broader perspectives by benefiting from courses in a variety of closely related academic areas. The program is expected to attract individuals who are interested in studying scientifically up-to-date explanations of human mind and behavior in today’s changing world. The program aims at producing research and teaching in high international standards. The language of instruction will be English. 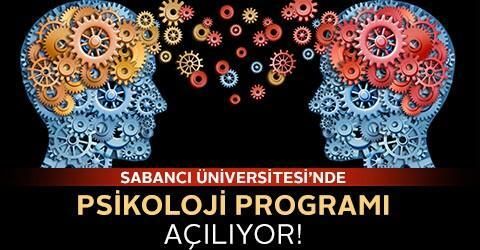 Studying Psychology at Sabancı University will not only help students to master existing knowledge from the angle of multiple approaches (such as cognitive, social, biological) to the field of Psychology but also to acquire researcher skills needed to contribute to the knowledge themselves. Such an emphasis on theory and applied skills will provide the necessary foundation for the graduates of this program who can then flexibly choose applied careers in human resources, marketing, education, counseling centers/hospitals and/or academic careers in research institutes and universities. Upon successful completion of the program, students are expected to excel in a variety of employment settings; such as the national and international NGO platforms, government jobs, industrial and organizational settings. They could also pursue graduate studies in a great variety of disciplines ranging from Sociology, Anthropology, Economics, and Political Science to Biology and Neuroscience. Contemporary Psychology focuses on human mental processes and behavior by spanning various levels of mechanisms from neural level communication to hormonal processes; from social and cultural influences to practical implications. Some of the fields that intersect with Psychology are Biology, Neuroscience, Computer Science, Economics, Anthropology and Political science. It is expected that Sabancı University’s strong commitment to the interdisciplinary approach will quickly become a natural habitat for the new Psychology program. Since Sabancı students start their education with a core curriculum in social and natural sciences through a series of Foundation Development courses, Psychology students will be well-equipped with an interdisciplinary lens earlier when compared to their peers in many other institutions. This type of breadth and diversity will provide Sabancı Psychology students with a competitive edge.